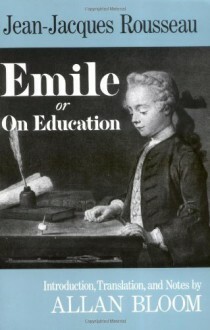 Alan Bloom’s new translation of Emile, Rousseau’s masterpiece on the education and training of the young, is the first in more than seventy years. In it, Bloom, whose magnificent translation of Plato’s Republic has been universally hailed as a virtual rediscovery of that timeless text, again brings together the translator’s gift for journeying between two languages and cultures and the philosopher’s perception of the true meaning and significance of the issues being examined in the work. The result is a clear, readable, and highly engrossing text that at the same time offers a wholly new sense of the importance and relevance of Rousseau’s thought to us.In addition to his translation, Bloom provides a brilliant introduction that relates the structure and themes of the book to the vital preoccupation's of our own age, particularly in the field of education, but also more generally to the current concerns about the limits and possibilities of human nature. Thus in this translation Emile, long a classic in the history of Western thought and educational theory, becomes something more: a prescription, fresh and dazzling, for the bringing up of autonomous, responsiblethat is, truly democratichuman beings.